We learn in school that everything is connected, from birds, insects, fish, dirt, and trees to our pets, our food, and ourselves. But to really understand how absolutely interconnected all life forms in an ecosystem are, it helps to experience those webs first-hand, inside and outside the science classroom. 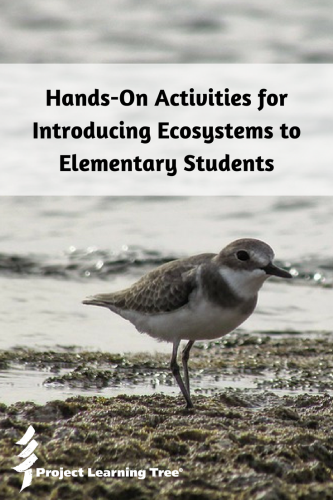 These hands-on activities enable your students to learn about ecosystems by exploring their own community and by building their own. We all live in incredibly rich ecosystems, whether or not we’re aware of the environmental diversity around us. Even in the largest cities you can find sparrows surviving on seeds, bees circling around flowers, and squirrels snacking on berries, all participating in the same network of energy, co-dependence, and survival. Take your students on a walk around the school grounds, or through a nearby garden or park, and ask them to make a list of all the different animals they see: birds, insects, mammals, lizards. Ask them, either during the walk or back in the classroom, what each animal eats and how it might be connected to other animals, to trees, and to humans. You might even have them think about how outdoor cats and dogs participate in the ecosystem too! Combine lessons in science with literacy by encouraging your students to keep a small journal of their schoolyard, park, or neighborhood wanderings. This is a great sample starter page. Ask them to choose an animal they saw in their area and write a mini-report about it. To get students thinking more about how energy works in ecosystems, have them write down how different animals, plants, and even fungi they encounter (or learn about) might be connected. Perhaps they observed a cat hunting mice, a robin harvesting twigs for a nest, or a hummingbird feasting on nectar. You could even ask them to imagine a day in the life of one of the animals they saw. What do they eat? Where do those plants or animals get their energy? What kinds of predators do they need to watch out for? Once you have started these journals, students can continue using them over several days or even weeks to track the gradual changes from one season to another, monitor the progress of a garden or potted plant, and describe dramatic weather events. Getting students to think about the natural environment that surrounds them is a great first step in helping them understand how ecosystems work. However, sometimes it’s impossible to venture outside, and it’s also important for kids to consider ecosystems other than their own. This simple activity from Project Learning Tree introduces kids to food webs and food chains using the example of a forest ecosystem with many different species of plants and animals. As kids connect these species together, they’ll come to understand that every species is essential for an ecosystem to stay healthy, no matter how big or small. You can also get your class onto its feet by turning this activity into a game: all you need is a ball of yarn and some name tags. Once your students have had a chance to try the activity on paper, assign each of them (and yourself) a species from the forest ecosystem and give them a matching species name tag. Then, gather all your students in a circle. Start the game by throwing the ball of yarn to one student and explaining how your species is connected to theirs. He or she, in turn, chooses someone else in the circle. After explaining how their species is connected to the species represented by the student they chose, toss them the ball of yarn. Continue until every student is linked into your classroom ecosystem. Once all the students are part of the ecosystem web, you can ask questions to explore how changes in habitat and predators affect the web. For example, you might ask: If a farmer kills all of the wolves in the area to protect their livestock, how would it affect the ecosystem? Have the student representing the wolf let go of their string to show that the wolves are no longer part of the web. This exercise further demonstrates how connected the ecosystem really is. Want to integrate a comprehensive unit on ecosystems this year? Ecosystems are more than food chains or food webs. For students to really understand how ecosystems work, it’s important for them to realize that energy and moisture cycle through ecosystems in ways that we may not be able to immediately see. In addition, some of the most important members of ecosystems are microscopic, invisible within the dirt. One of the best ways for kids to learn about these key elements of ecosystems is through building a self-sustaining ecosystem in a bottle. There are many different ways to build bottle ecosystems. The simplest ones are basically closed terrariums, consisting of plants, either land-based or aquatic, and a bit of rich soil, compost, or pond water. Others, built from soda bottles, combine aquatic and land-based life forms. On the bottom level place some rocks, pond water, and maybe a few marine invertebrates such as shrimp or snails. You can even include fish, as in this example. Although, any fish you include will have to be fed daily, which does make the ecosystem no longer self-contained. The top level includes microbe-rich soil or compost, perhaps a small earthworm or two, and the plants. A lot of planning goes into building a bottle ecosystem, but you can easily make that planning a learning process by putting some of it in the hands of your students. As this how-to suggests, let them work in teams to chose which kind of biome to create and research what plants thrive in that biome, along with what type of soil and what nutrients those plants need. They might choose a desert biome with succulents, a temperate biome with flowers, or rainforest biomes with ferns. Building the ecosystem is just the beginning. Ask students to monitor their ecosystems and keep track of them in journals. You might want to even gather measurements of temperature, plant growth, and humidity. The most successful bottle ecosystems will thrive with absolutely no maintenance. In fact, one man in England has kept a simple, closed ecosystem going for forty years. Others may need minor attention, such as picking out dead leaves, or refreshing the water. Let students draw their own, gradual conclusions about why their ecosystem is struggling, or how the plants and animals continue to survive. What they learn in maintaining bottle ecosystems may help them take care of plants and animals throughout their whole lives! Once your students grasp how everything in nature truly is interconnected, they’ll be full of questions about what links different kinds of creatures together, and how changes to one element can affect the ecosystem as a whole. That makes learning about food webs and ecosystems a natural first step towards introducing lessons and activities about sustainability and climate change, and towards helping them become eager and informed stewards of our environment. Have you tried making environmental journals or bottled ecosystems in class? Do you know of other activities relating to food webs or ecosystems? Share your stories and ideas in the comments below!